Mexico and Ireland: a lasting relationship forged by potatoes. Happy St. Patrick’s Day! In honor of St. Patrick’s Day, we offer this short list of references highlighting some of the more significant connections between Ireland and Mexico. Séamus Ó Fógartaigh in his “Ireland and Mexico“, published in Irish Migration Studies in Latin America by the Society for Irish Latin American Studies (based, curiously, in Switzerland) looks at the early links between Ireland and Mexico, including suggestions that the travels of St. Brendan the Navigator may have inspired Christopher Columbus and that the famous “Plumed Serpent” of Mexican mythology may have originated from the deification of an Irish monk. Much better known are the later links. During colonial times, several of the Spanish administrators sent to New Spain (now Mexico) were direct descents of Irish exiles to Spain. They include the 63rd and last Spanish Viceroy of New Spain Juan O’Donojú (formerly O’Donoghue) who arrived in the New World shortly before Mexico became Independent in 1821. A generation later, Irish soldiers who chose to leave (deserted) the US army formed the backbone of Mexico’s St. Patrick’s Battalion (Batallón San Patricio) which fought the invading Americans in 1846-48. They are especially remembered for their bravery in the Battle of Churubusco (in Mexico City) in 1847. Their story is well remembered by Mexicans today, their exploits commemorated every year at a ceremony in Mexico City, and the basis of several books and the movie One Man’s Hero. The single, best account is that by Michael Hogan in The Irish Soldiers of Mexico. For a summary account, try “The St. Patricio Battalion, The Irish Soldiers of Mexico” by Jaime Fogarty, published in UNAM’s Voices of Mexico magazine, April-June, 2000. In the twentieth century, Álvaro Obregón (family name O’Brien) was President of Mexico from 1920 to 1924. (We will take a critical look at his relationship with the indigenous Yaqui Indians of Sonora in a later post). The city of Ciudad Obregón in Sonora is named in his honor. Artists of Irish descent also impacted Mexico’s national life. They included architect, painter and muralist Juan O’Gorman (1905-1982), responsible for the monumental mosaic that adorns the walls of the National University (UNAM) Library in Mexico City, and a striking, colorful mural in Pátzcuaro that depicts an erupting volcano; this mural was completed just one year before the unexpected eruption nearby of Paricutín Volcano. Today, according to Wikipedia, there are between 300,000 and 600,000 people of Irish descent living in Mexico, mostly in either northern Mexico or Mexico City. Dr. Michael Hogan has done far more than most to publicize the links between Ireland and Mexico. In this 8 minute Youtube video clip, he talks to an Irish radio show host about the San Patricios, Irish and Mexican history, music and tequila. Most of the links we’ve described might never have happened if Mexico had not sent an unwanted export to Ireland in the middle of the nineteenth century. The census of 1841 in Ireland recorded a population of about 8 million. The staple Irish food at that time was the humble potato and Ireland’s rapid population growth during the early part of the nineteenth century was based on the so-called “potato economy”. Ireland was bursting at the seams in 1841, but just a decade later, after the potato famine, the population had fallen to 6.5 million. The cause of the Irish potato famine was a water mold (Phytophthora infestans) that originated in Mexico and crossed the Atlantic in the 1840s, reaching Europe in 1845 before rapidly spreading across the continent to reach Ireland. 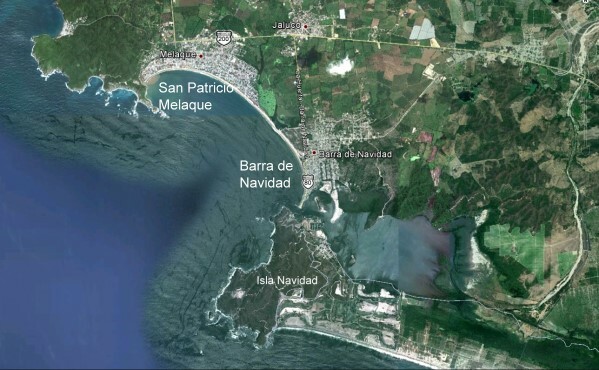 If a Mexican water mold had not provoked the Irish potato famine, maybe there would have been no settlements named San Patricio in Mexico today, and no cause to celebrate St. Patrick’s Day in Mexico! Wherever you may be, have a very Happy St. Patrick’s Day!